The Final of the third annual Hand-in-Hand 50-overs U-19 Inter-County cricket tournament, originally set for Saturday and postponed to yesterday, was again washed out without a ball being bowled after more ‘all night’ rain left the Lusignan ground waterlogged. Berbice are favoured to win the double after lifting the 3-Day Title. Three-day Champions Berbice were set to oppose last year’s 50 overs finalists the National U-17’s in yesterday’s final. The U-17s finished second in the preliminary rounds, while Berbice won all three of their games to finish on top. The GCB has not set a date for the now twice postponed final and all concerned will be hoping that there is an improvement in the weather. “Please note that the finals slated for Sunday 29th April, 2018 has been postponed due to the continuous inclement weather over the weekend. Alternative date to be announced subsequently,” the GCB said in a release yesterday. 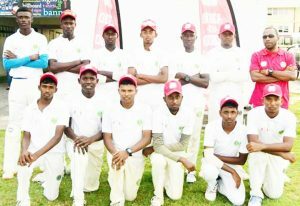 The new date could possibly give the GCB some extra time to purchase Red shirts for Berbice and Green Shirts for the National U-17s and play the game with a white ball, which the Regional 50-over U-19 Tournament in Barbados will be contested with from July. When contacted yesterday, Hand-in-Hand’s Director Howard Cox told Kaieteur Sports that the Insurance Company would have had no problem funding the cost for coloured shirts for the 50-over version. He explained that the GCB did not ask for the 50-over format to be played with white balls, adding that Hand-in-Hand was just going with what was done in the past. “The Board provided a budget to run a three-day competition and a 50-over competition which included the cost of balls. They never mentioned the colour of balls or shirts for the 50-over format,” Mr. Cox explained. The last time Berbice won the title in 2015 the tournament was played with Red balls and sponsored by Raj Singh Insurance Company. Raj Singh, the Marketing Manager of the GCB had told Kaieteur Sports then that funding was the main reason why White Balls were not used. This tournament is being used as preparation for the Regional competition and to select the U-19 squad for that competition which is played with White balls and those with knowledge of cricket know that the White ball swings more than the Red one. Mr. Cox said he is aware that limited overs cricket is played with White Balls and coloured clothes, adding that today he will talk to the GCB about the possibility of playing the final with White Balls and coloured Shirts.